The Sylvania SDVD7040B 7" Portable Swivel Screen DVD Player is a compact DVD player with a 7" LCD swivel screen and several convenient features. It folds up to a compact size so it can tag along wherever you go. Even though it's small, that doesn't mean you won't get clear picture quality from your DVD collection. This DVD player has a rechargeable lithium battery so you will be able to watch your DVDs wherever you go. In addition to DVDs, this disc player supports CDs and JPEG files, so it can multitask as a music player and it can also display your photo files on its screen. Sylvania has also included a car adapter so you can take it on long car trips. If you're looking for an affordable DVD player in an ultra-portable package, the SDVD7040B is a smart choice. 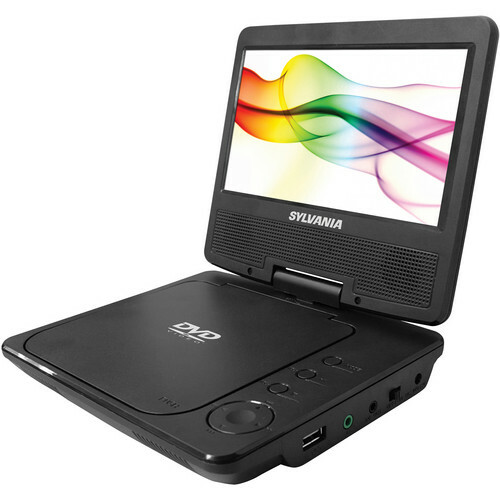 Box Dimensions (LxWxH) 9.5 x 7.9 x 1.7"
SDVD7040B 7" Portable Swivel Screen DVD Player is rated 3.3 out of 5 by 4. WHICH RECHARGER SHOULD BE USED? Remote won't work. When I press play button on dvd player itself, it start video over and plays previews again and again. when using cd does it have resume feature? This player will offer a resume disc feature: Press STOP once to stop playback; then press PLAY to resume playback from the point where you stopped; press STOP twice to stop playback completely). During playback, press PLAY to pause; press it again to resume playback. Drop the DVD in and press the PLAY button. Can this work in different regions? This device will support Region 1 DVDs only. Is this brand new or refurbished? Can this unit play DVD+R DL Double Layer DVD's? How do I tell when the battery is fully charged? LED light on front panel will turn Yellow when fully charged. LED light will be Red when charging. Charge lasts between 2-3 hours. NOTE: Unit will only charge when power switch is OFF.